Looking northeast at soon to work LinkNYC station. Photo by Jim Henderson. New York City has been transitioning to a city of free-WiFi, but somehow Brooklyn has been left behind. But not anymore. 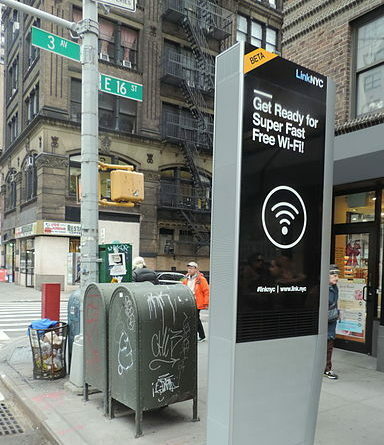 Brooklyn joined the world of superfast communication when two hot-spots were switched on. Both of them are in the Bedford-Stuyvesant neighborhood, on Fulton Street, but do not fret; that is just the very beginning. 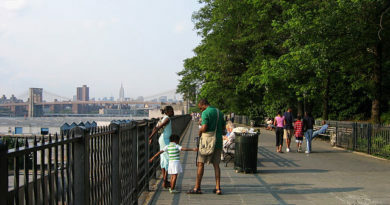 Brooklynites should not fear that to get their free Wi-Fi they will have to travel to points far flung. The near future is poised to bring free Wi-Fi to nine more areas in the weeks ahead. Expect to see free internet access near LIU-Brooklyn and in Prospect Park. Staten Island is not being left behind, either. It already has its first kiosk, with many more on the horizon. 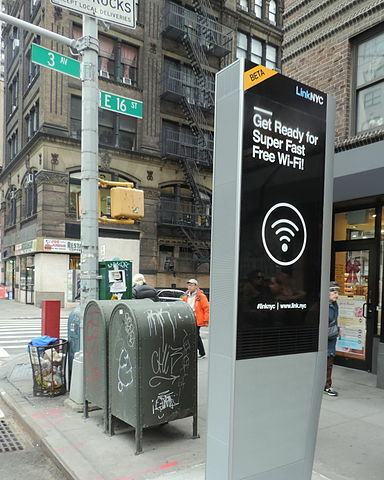 All this connecting is made possible by LinkNYC, which offers more than just free internet access for phone calls. In addition to free domestic phone calls there will be easy connections to 311 and 911. Plus, if your phone’s battery is running low (again! ), just plug into the USB ports also available at the kiosks. Tablets will allow users to look up services in the city, and the kiosk itself will have on display public service announcements. LinkNYC does not allow free web browsing, which it did in its early days. But it does allow travelers and the homeless, and others without guaranteed internet phone service to stay connected in the greatest city on earth.